Question: Is your business legal in Finland? Answer: Yes. 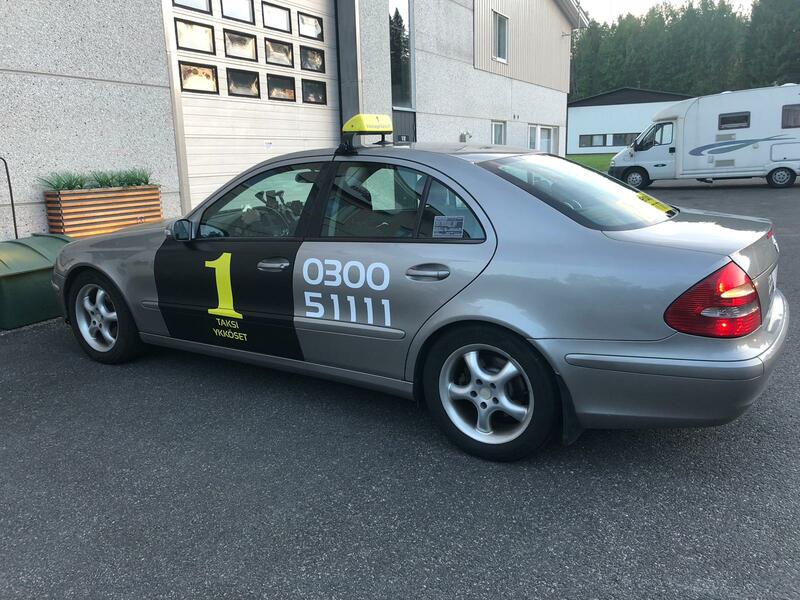 We are official taxi-company, 100% based on Finland laws. We have all required transportation-licences, licensed drivers, taximeters and yellow taxisigns. Our pricing is always inexpensive and tempting. We have online credit/debit-card processing machines as well as we always offer you a receipt for your ride. Answer: We accept all major payment methods, cash, all debitcards/bankcards, Visa Credit & Debit, Visa Electron, MasterCard Credit & Debit, Maestro, American Express, Diner’s Club. Unfortunely “taksiraha-cards” are not accepted in our cabs. We also do not accept Kela-fundings (KELA) and City-fundings (VPL). Question: Why your prices are always so inexpensive? Answer: Because we would like to give the nicest possible taxi-rides with cheaper prices, magnificant and classic Mercedes-Benz cars and with top quality service, please welcome. Question: Who owns Suomen VintageTaxi.fi Oy Ltd corporation? Answer: Suomen VintageTaxi.fi Oy Ltd is a Takamaa family-corporation and currently the official owner is “Daddy” Tero Takamaa, who has almost 7 years of expereince of taxi-business. Question: How many cars the corporation owns? Answer: Currently we own 5 cars and 6th is on the way. We are planning to buy more of these taxi-cars. Question: Why do you use only Mercedes-Benz brand? Answer: Because we think Mercedes-Benz is always safe, top quality and always ahead of other brands. We also have one VW Crafter in use now. Question: Do your drivers have official Finland Taxidriver-licences? Answer: Yes. We require from every driver a valid Trafi based taxidriver-licence as well as Finnish driving licence. Question: Do you have all the required insurances in your cars? Answer: Yes. Our cars have all the mandatory taxi-insurances in Finland. Additionally our drivers are covered with accident insurance by the corporation. Question: What kind of rides can I order? Answer: You can order taxi from us at Jyväskylä and surrounding areas. You can call our taxi from number 045 7877 7787 (international format: +358 45 7877 7877) or from Taksi1 consept on number 0300 51111 (international format: +358 300 51111) or catch it on the “fly”. You can also order longer rides from/to Jyväskylä from/to everywhere in the country or even to abroad. For example our “agreement-price” 1-4 persons from Jyväskylä to Helsinki airport or vice versa is 399€, icluding 10% VAT, pickup, small waiting, parking fees, coffee break and of course the ride. Also we have offer on 1 hour Jyväskylä-sightseeing for one person, only 99€, including 10% VAT. Additionally we can agree price with you on our car & driver to your wedding parties, bachelor-parties and all kind of your occasions. We also have unique 24/7 express-packet-service, where we take your packet, up to 1 000 kg, everywhere in the country or abroad in record short time, on only one hour notice. So in the nighttime for example, you have a need to send a packet to a hospital in Helsinki for morning, we will pick it up and deliver it, always on time. You can also order us by using KYYTI (application more info www.kyyti.com ). You can dowload it to IOS or Android phone from your phone shop. Question: How can I be a driver in your corporation? Answer: You can take our taxi-driver course and you must pass Trafi test and send your CV (Finnish or English only) with possible attachments by email to rekry(at)vintagetaxi.fi. On our signed full time agreement we dedicate “own” car for you and you need to make at least small-business-company, “Toiminimi” in Finnish, which then can invoice us commission of all drives (VAT deducted) of the month. To the short time drivers we pay at least 32% salary (of your net driving) + vacation-, overtime- and sunday- and night-extras. You must speak, read and write fluent finnish and english. Question: Does your pricing include Finland VAT-tax and can I get a receipt? Answer: Of course, always. In transporting people the VAT is always 10%, and for packets always 24%. And yes, we always offer you a receipt, of every ride. Question: Are you making corporate-agreemets, for example weekly/daily regular rides? Answer: Yes, we would love to. We can negotiate tailored agreements and if you need, these agreement-rides can also be invoiced. Question: Do you use any callcenter services or applications for internet orders? Answer: No. You can always order us by calling, email, using KYYTI application or our intenet page or catch us on the fly or any taxi poles of Jyväskylä. Question: If I have more questions can I ask you, where and how? Answer: Of Course. By calling 045 7877 7787 (international format: +358 45 7877 7877) or email support(at)vintagetaxi.fi or at our Facebook page https://www.facebook.com/vintagetaxi.fi and of course in our taxis as well. Either in Finnish or English.